As we celebrate Labor Day in 2012, we confront the hardest questions about our future. The Industrial Revolution, for all its early horrors, offered vast employment opportunities and a higher standard of living for many millions of people. It enabled general education and powered democracy. It facilitated the consumer economy. The vast companies set up by the steel barons and Henry Ford and their like provided lifetime employment for hardworking men and women. The companies remain – but we know that’s all over. These are my questions. To America, to its leaders, to its people. They aren’t partisan (the big issues no longer fit the partisan divide). They’re tomorrow’s questions. Unless we have answers, we can’t make today’s decisions. And before we go any further: There is something terribly Narcissistic about “knowledge workers,” people like you and me, who hang on Twitter and blog and one way or another are shaping the future. We claim no superior status to those who labor hard with their hands. We may shape the conversation, but it is to our embarrassment if we do hot shape it to include them – just as the uber-rich are to be despised if they find their self-worth in their net worth. It is together, as fellow members of Homo sapiens, radically equal, women and men, in the equation of human worth, that we are called to tackle the greatest of questions of C21. Kindly join me. 4. How do we re-engineer our public schools to lead the world again? The STEM mantra (science, tech, engineering, math) is exactly that. A mantra. Even if we revolutionize our public schools (ha!) it will take half a generation to make a difference. How do we build a techno-literate culture, at all levels? 5. And the fate of the essentially uneducated? Aside from the millions of poorly-educated and/or poorly-gifted kids, we have a massive underclass who are hard to employ now and are fast becoming impossible ever to employ. Is this the hardest question? There are answers, in part and pro tem; but unless these are the questions there will never be sufficient focus on those answers to drive home the changes they require. 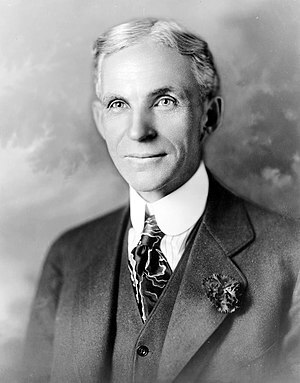 This entry was posted in business, emerging technologies, future, innovation, policy and tagged Henry Ford, Industrial Revolution, Labor Day, United States by Nigel Cameron. Bookmark the permalink.